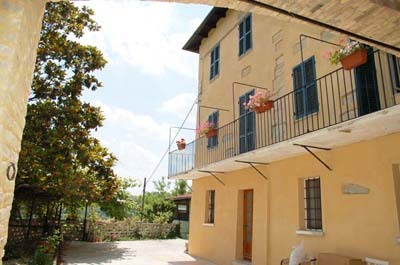 Casa Anna is a former farmhouse that we have renovated into a holiday home that accommodates six. The house has lovely views of the countryside. 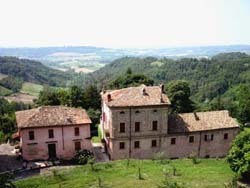 Casa Anna is located in the lovely, quiet village of Ponzano Monferrato. It is beautifully situated in the vine clad hills of the Piemonte region in northwest Italy. Facilities such as supermarkets, restaurants and swimming pool are nearby. Casa Anna has two floors (the 3rd floor is the attic and not in use). On the ground floor there’s a spacious lounge, a dining room (with a lovely vaulted brick ceiling) and a fully equipped kitchen with dishwasher, washing machine and a large 5-burner SMEG cooker with oven. The kitchen also has a lovely vaulted brick ceiling and an exposed “tufo” stone wall. Relatively nearby there is also the Natural Park of the Po, where you can hike, bike (nice and flat), go kayaking and bird watching. From here cities such as Milan, Turin and Genoa are easy to reach by car or train. At nearby Asti (30km) – renowned for it’s “Asti Spumante” dessert wine – every Wednesday and Saturday you can stroll over the huge market. Or do some shopping, sit on one of the many terraces or visit the cathedral. A daytrip to Lago Maggiore or Lago d’Orta is another possibility. It will take about a 1,5 hours drive to visit these wonderful lakes. But perhaps you prefer a trip to the magnificent Alps. Again about 1,5 hours and you’re in the region where the 2006 winter Olympics were held. 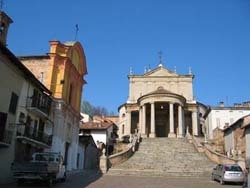 The medieval town of Moncalvo – the smallest city of Italy – is five minutes away by car. The main piazza has lovely café’s with terraces and other facilities such as banks, shops, restaurants, a weekly market on Thursdays and on every first Sunday of the month an antique market. Moncalvo also has a nice public swimming pool. In the valley between Ponzano and Moncalvo – a two minutes drive away – there are three supermarkets and a.number of gas stations. 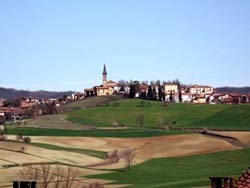 Behind Ponzano is “Santuario di Crea” (a UNESCO heritage site). “Santuario di Crea” is one of the nine Sacri Monti (holy mountains) in Northern Italy. Crea is called a holy mountain because there’s a monastery with 23 separate chapels scattered over the hill, dedicated to the mysteries of the rosary. In the Middle Ages not many people could afford a trip to Jerusalem, so these holy mountains were created as alternative pilgrimage sites. The hill and surrounding area is part of the 47-hectare nature park of the Sacro Monte di Crea. Around the monastery and chapels are many picnic spots and tables. The park also has many hiking and mountain bike routes. The Piemonte region is one of the best kept secrets of Italy. At times it reminds you of Tuscany, however as there is less tourism, the region keeps it’s authentic character. This also helps to keep the restaurants affordable. There is great food here, the region is especially renowned for it’s truffle. And don’t forget the delicious wines produced in this region. You’ll find the king and queen of Italian red wines – the Barolo and the Barberesco – here. But the delicious and affordable wine of the region is the Barbera d'Asti. The famous “Slow Food” movement started in Piemonte for a reason! 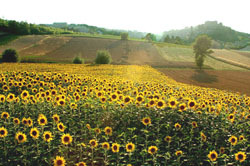 In short, discover undiscovered Piemonte. On the first floor are three spacious bedrooms, a spacious hall and two bathrooms. The house has been recently (2009) renovated, while maintaining many original details such as vaulted brick ceilings and original “tufo” and hardstone features. For the real sun-lovers there is a large sun terrace on the first floor with a panoramic view of the surrounding hills & vineyards. On the ground floor you’ll find a spacious courtyard. If you prefer a bit of shade Casa Anna has is a covered terrace with a dining table for “all fresco” lunches and dinners and a nice lounge set where you can read and enjoy the views. To catch more of a breeze we also have a nice shady table set under the pergola covered by an old kiwi tree. Click here for a plan of Casa Anna.